We bring you the best TV, movie & gaming merchandise from our online store, to your front door with free UK delivery. 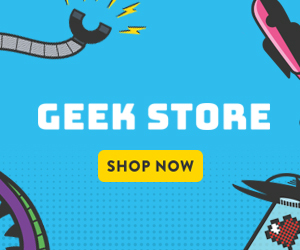 Follow Geek Store to get news updates and products on your homepage. Geek Store is being followed by 0 people. UK Delivery Details: Free UK delivery. Geek Store is currently ranked 69 in the directory. Last month its rank was 69. 1 products added to Geek Store 1 day ago. 30 products added to Geek Store 4 days ago. 124 products added to Geek Store 7 days ago. 8 products added to Geek Store 11 days ago. 105 products added to Geek Store 14 days ago. 486 products added to Geek Store 23 days ago. A Special Offer was added for Geek Store: Get any Calendar or Diary for £1 (RRP £9.99) ... 35 days ago. A Special Offer was added for Geek Store: Save Up to 70% with Geek Store Exclusive Bundles! 35 days ago. 1727 products added to Geek Store 35 days ago. A Special Offer was added for Geek Store: Free UK Delivery On All Orders 50 days ago.